Perhaps you have experienced the terrible feeling when your head is stuffed with ideas for writing an essay, but you don’t know where to start, or after writing a couple of sentences, you get stuck and can’t move on. In these, and many other cases, outlining is a procedure that can help you to get words down in an organized fashion; generally speaking, an outline is a framework for your writing. Therefore, knowing how to create an outline is vital in crafting a piece of writing. Choose your general purpose. In other words, decide what kind of essay you are going to write: persuasive, descriptive, reflective, or any other type. This will give your thoughts a general focus. Then, formulate your topic. Research and gather as much supporting information as you think is necessary. After you collect your needed materials, think about how to organize them best. For example, you might want to organize them chronologically, or by theme, or in case you are introducing several arguments, you could introduce those that contradict your opinion first and then disprove them with those which you support. Decide how you are going to break the topic of your paper down into smaller sub-categories considering the information you’ve gathered so far. Each paragraph of your essay will be dedicated to one of these categories. After that, distinguish the main points that will be covered in each paragraph. Sketch out your introduction section. Usually, in the introduction you present your thesis statement and briefly preview the rest of the essay. 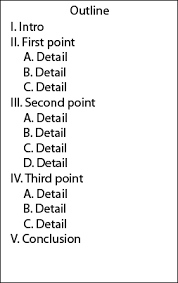 In the main body section, organize the main points of each of the categories and list appropriate supporting evidence under each of these points. The conclusion section summarizes the main points from each paragraph and shows how you’ve reached your conclusion. You may include an afterthought as well, which makes readers think about your topic more after reading your essay. Review your outline to make sure you haven’t missed anything crucial and that information is organized logically. Creating an outline will make it clearer for yourself as to what information you are going to include in your essay. Outlining helps you identify your main ideas and topics, and organize them in a brief and concise manner. Outlines generally can be divided into two categories: topic outlines, and sentence outlines. Creating a topic outline implies that you write in short and general phrases; this makes your outline more flexible, so when using it to write an essay, you can introduce some changes in the content of your paper. Sentence outlines imply writing in a detailed and complex manner in complete sentences. Spend time to make a detailed outline, since the more work you put into it, the less time you’ll need to spend on writing itself. An outline can help you not only determine what to write, but even control the length of the paper, which is useful if you have a tough-to-abide-by word limit. An outline can turn writing an essay into essentially a fill-in-the-blank exercise. Do jot down all the points and categories you make during creating an outline. For example, you could mark categories with Roman characters, main points with Latin letters, and sub-points with digits. This will make your outline more structured and much easier to navigate. Do make some additional notes that do not directly refer to the content of your future essay, yet can be helpful. For example, you can note the source in which you can later read more about some point from your outline or clarify the way of presenting certain information. Do take some time to create an outline. If you wait until the last few hours before the deadline to try to write an outline and an essay, you won’t succeed in both. Do use drawings, schemes, and other graphics to illustrate connections and correlations between points and categories specified in your outline. Don’t treat writing an outline as a task that is done simply for the record. In fact, many students find that outlining makes the process of essay writing much quicker and easier. Don’t have less than two points in any category. The more significant points you add, the more complex and credible your future essay will become. Don’t be afraid to reorganize your outline;\, reformulate and replace categories, add or exclude main points and supporting evidence, and change the structure of your future essay if needed. Don’t feel obliged to follow the outline you’ve created yourself precisely; in fact, you can deviate from your plan and include information that was never mentioned in the outline if you determine it to be of essential value. Don’t start writing an essay until you are satisfied with your outline completely, with the way information is divided and organized in it, and with the supporting evidence you decided to include in your paper. – Rushing to do the research and organizing the information without clearly formulating the purpose and the topic of your future essay. – Writing an outline as some kind of brief essay. Your outline is a scheme, a framework of your future essay, and not the essay in miniature. Treat an outline as a blank space you will later need to fill. – Trying to include all the information you found during your research into the outline and later into the essay; feel free to eliminate irrelevant information. – Delaying writing an outline, and then trying to compose both an outline and then an essay under time pressure. At best, you will create a poor outline and a low quality essay, or you won’t manage to complete at least one of these tasks.